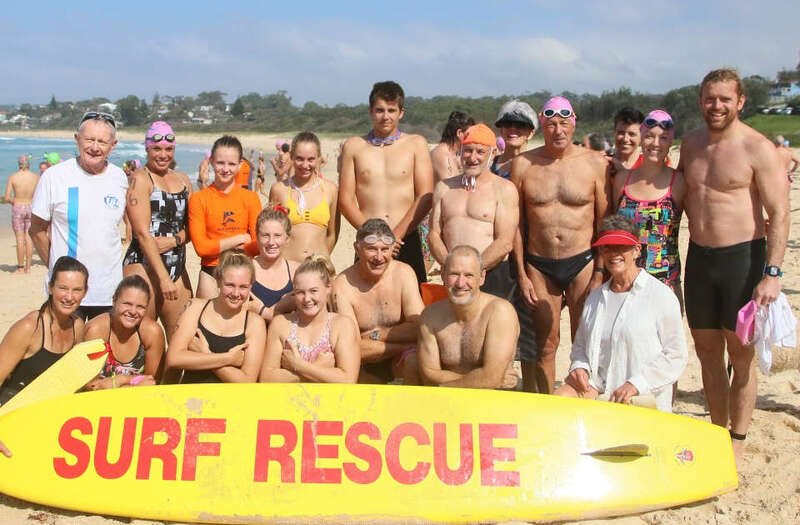 Mollymook Ocean Swimmers – 2019 was our biggest turnout of local swimmers. GOLD, GOLD, SILVER, SILVER & SILVER to the Mollymook Surf Club athletes. A momentous day for the Mollymook Surf Club at the Aussie titles. All five entrants for the beach flag events progressed through the many heats to qualified for the finals. Viz. Open Female: Kate Lewis and Payton Williams, U/19 Female: Payton Williams, U/19 Male: Brock Scrivener, U/17 Male: Sammy Zustovich and Jack Bridges with Sammy also contesting the Open Flags. 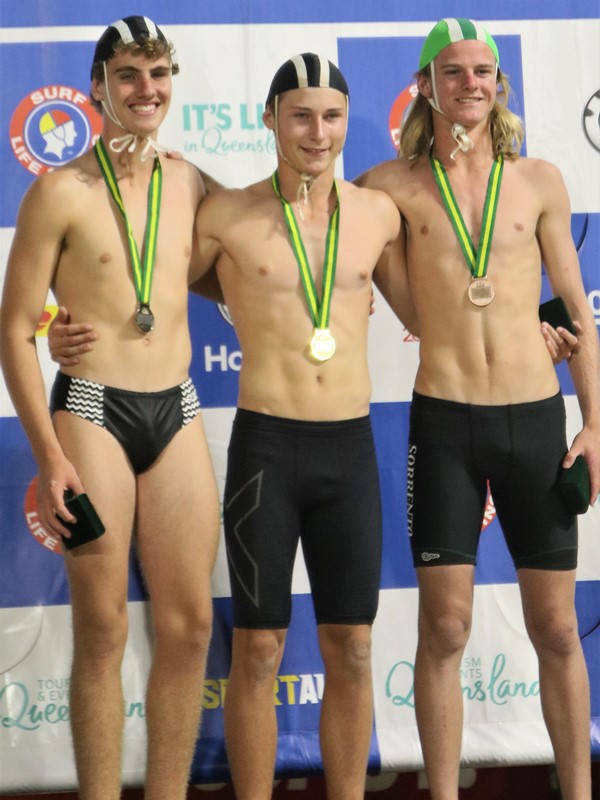 Mollymook athletes won medals in four of the six finals run under floodlights at this gala Saturday evening event. Sammy won GOLD in the U/17 male and SILVER in the Open male flags. Brock won GOLD in the U/19 male flags, Payton claimed SILVER in the U/19 female flags as did Jack Bridges claim SILVER in the U/17 male flags. Full credit to their coach Daniel Robberds who was instrumental in achieving these amazing results from brilliant young athletes causing Mollymook, Mollymook, Mollymook to resonate among the huge crowd present throughout this evening event. 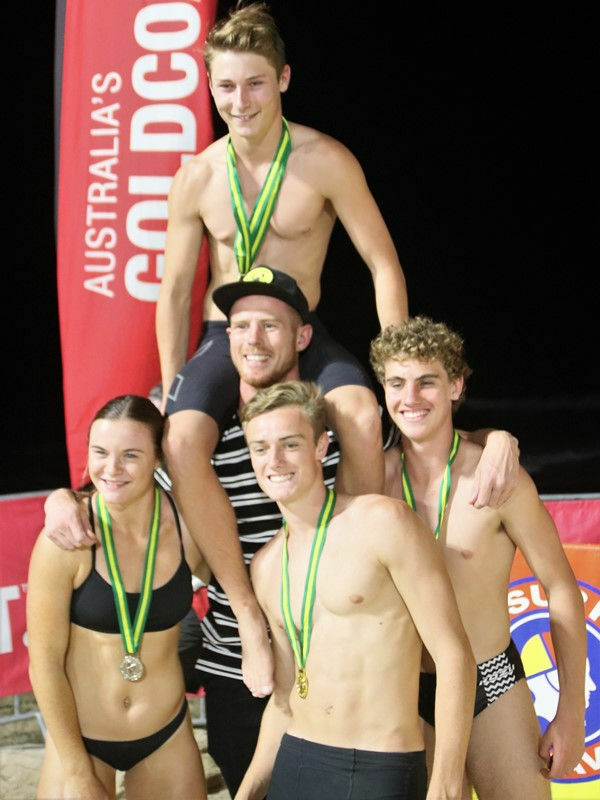 GOLD, Sammy Zustovich, Mollymook Surf Club – U/17 Beach Sprint, BEST in AUSTRALIA. 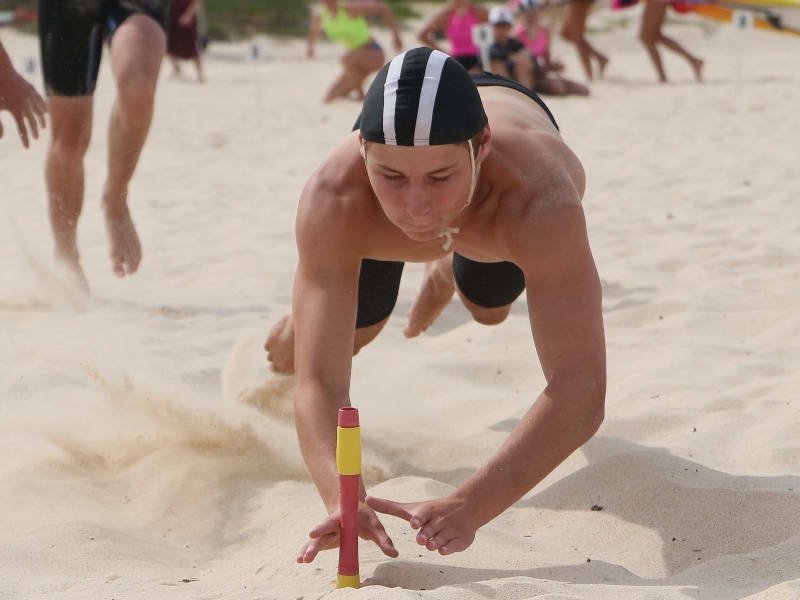 (140 entries in U/17 Male Beach Sprint). U/17 Male GOLD MEDAL, Sammy Zustovich, Mollymook Surf Club. 2019 Aussie Surf Titles on the Qld. 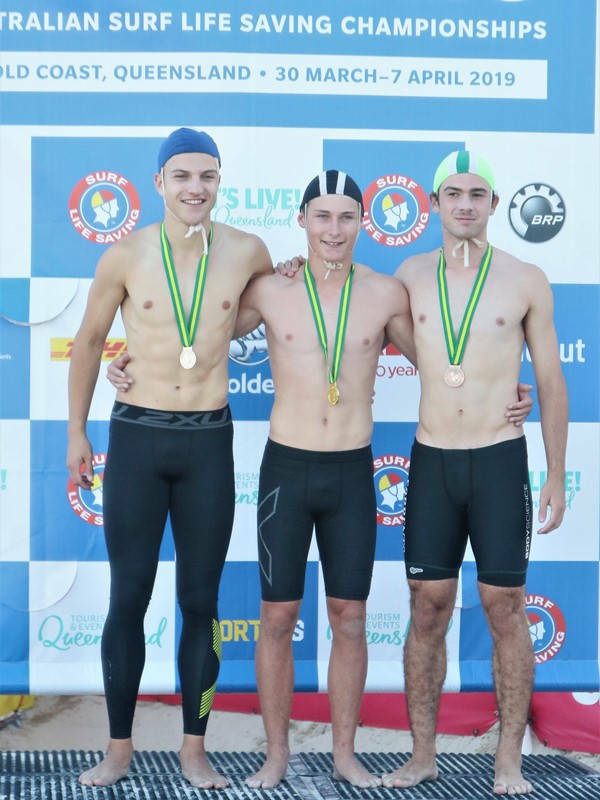 Gold Coast attracted 6500 competitors from over 200 clubs throughout Australia. 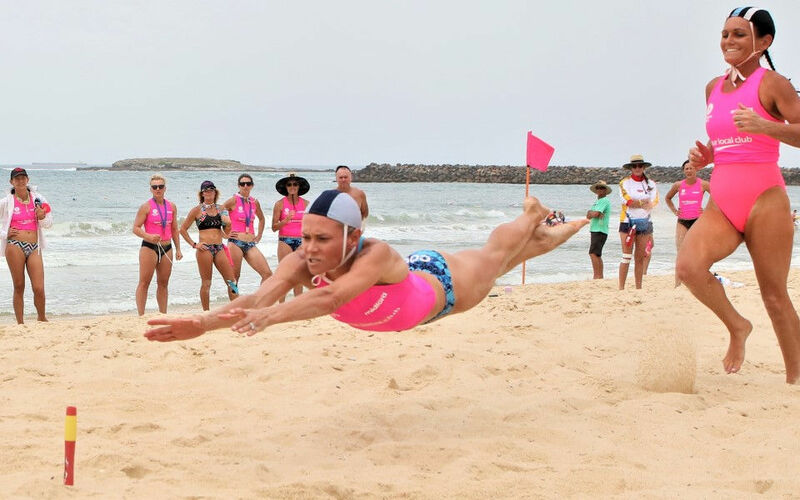 Today the Beach Sprint Finals took place at Broadbeach whilst many of the water events were transferred to Kirra Beach due to the surf conditions. 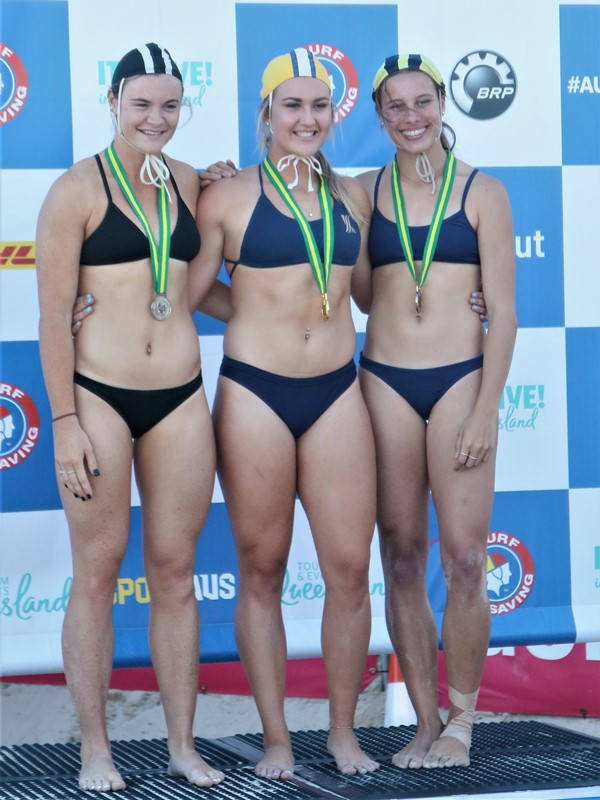 Mollymook Surf Club was represented in the beach sprint finals by: Payton Williams in the U/19 Female finals, Brock Scrivener in the U/19 Male finals and Sammy Zustovich in the U/17 Male finals . To appreciate the magnitude of their efforts, the U/19 males had 83 entries, the U/17 males 140 entries and the U/19 females 71 entries. Heats were initially run with 9 in each heat and the first 4 progressing through to the next round. It was ‘nail biting’ stuff with the best in Australia competing in the these finals. Payton Williams was the first Mollymook Surf Club athlete to line up in a star studded field. There was nothing in the finish with Payton claiming the SILVER medal. Brock Scrivener was Mollymook Surf Club’s second finalist. He put in an awesome performance just to miss out on a placing as the top five sprinters crossed the line almost together. Sammy Zustovich was Mollymook Surf Club’s 3rd finalist to line up at the start. Absolute blistering pace saw Sammy cross for GOLD in another star studded field. Dani Holt, Mollymook. Her first race at the Aussie Surf Titles. A BIG Surf had arrived overnight. Danielle Holt of the Mollymook Surf Club competed in the U/17 Female surf race. There were 5 heats with upwards of 30 girls in each heat with the first 15 proceeding through to round 2. Dani missed out by only two places. The surf conditions were appalling. Full credit to Dani (competing for Warilla) for such a gutsy swim in such difficult conditions. 2019 Aussie Surf Titles – Qld. 2019 Aussie Surf Titles, Broardbeach Qld. Where the BEST compete against the BEST! Similarly Dave Tudor-Jones in the 45-49 male events put up an huge effort in the heats to qualify for the semi’s and then the final of the board race to finish 6th. Later in the ski race he qualified 6th in the heat, followed by a 5th in the semi and 10th in the final. Likewise in the iron-man Dave came in 10th. 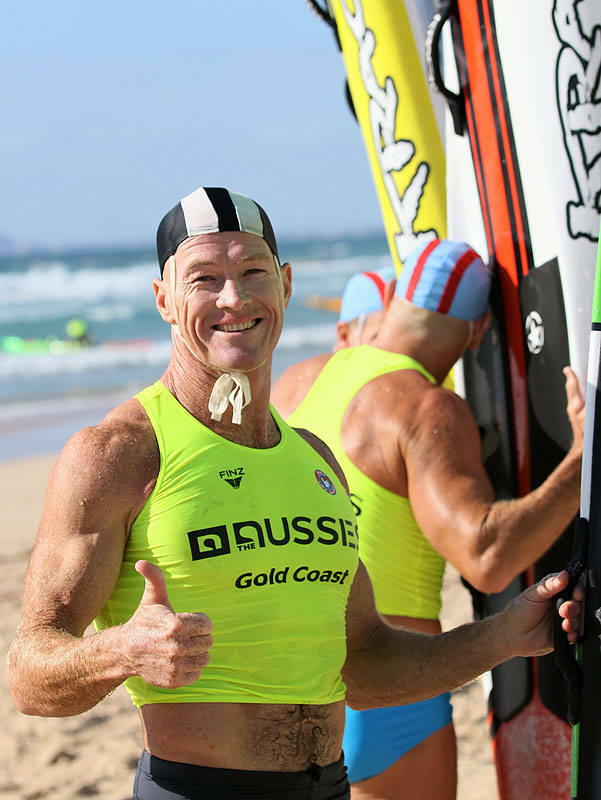 The quality of the competition can be seen from entrants such as former Australian Iron-man champion Guy Andrews winning the 45-49 Male iron-man and Grant Kenny winning the 55-59 Male iron-man events. 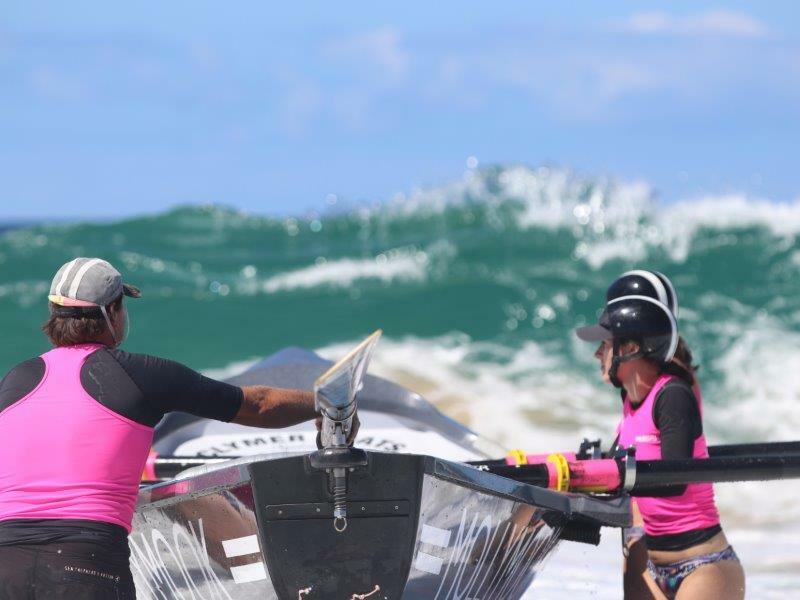 2019 – NSW State Surf Championships – MASTERS Competition, Days 1 & 2. Above is an example of the skill evident among the MASTERS competitors at the NSW Surf Championships being held at Swansea-Belmont’s, Blacksmiths Beach. In very tough competition Mollymook competitors made numerous finals and were reward with Bronze medals in the 2 km Beach Run and the Ski Relay. Above: Alicia Burazin, Kiama and Sammy Zustovich, Mollymook winning GOLD in their respective Flags Final. 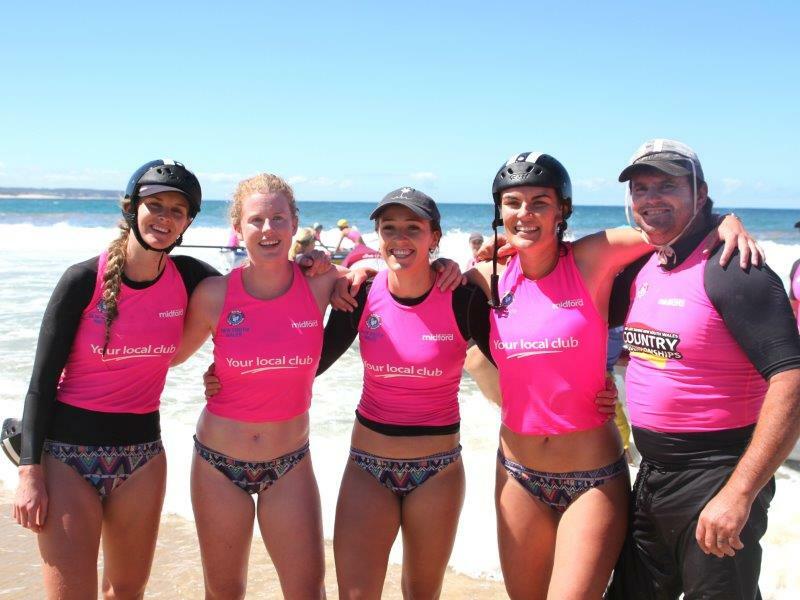 The South Coast Branch Surf Life Saving titles were held at Mollymook Beach this past Saturday February 16, 2019. Branch clubs include: Warilla-Barrack Point, Shellharbour, Kiama Downs, Kiama, Gerringong, Shoalhaven Heads, Nowra-Culburra, Sussex Inlet and Mollymook. Scroll down for Mollymook competitor results. The 2018 Mollymook Ocean swim was conducted in idyllic swimming conditions. 170 swimmers contested the 2.2 km main event. The overall male winner was Cormac Guthrie in a time of 24 min 22 sec whilst the first female home was Jordan White in a time of 25 min 42 sec. The aptly named ‘Squid Jigs’ and the treacherous sand bar they had to contend with. 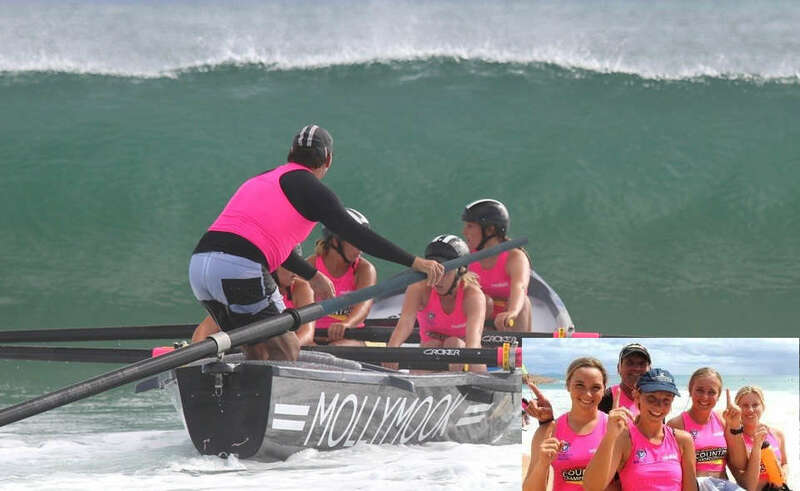 Action Shots on the Mollymook ‘Squid Jigs’ Ladies Boat Crew as they powered their way through this massive surf. A special mention must be made of the gutsy and memorable performance by our ‘Squid Jigs’ Female Reserve grade boat crew. The crew consists of Tessa Harris, Ebony Murray, Amy Pollard, Gemma Smith and sweep Marty Drysdale. Precision Start following the starters gun. With a southerly wind blowing the surf had risen noticeably in comparison to the previous days. 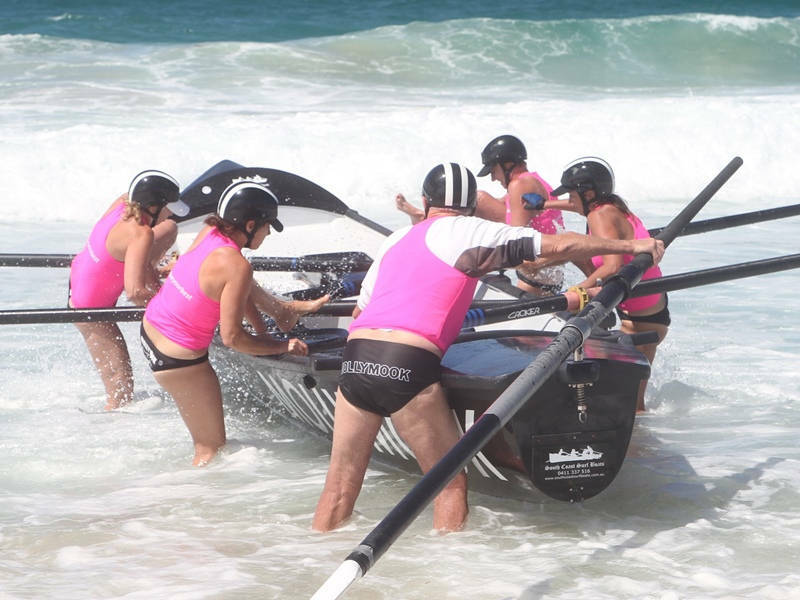 Day 3’s main focus was on the Surf Boat Racing by the ‘masters’ boat crews, male and female. The big surf resulted in a bit of carnage with the strong competition. The 180 Female swimmers crew of Simone Scott, Monica Mudge, Tracy Holt and Charyl Garin were swept by veteran Garth Brooks. They demonstrated enormous courage in the big surf conditions and rowed exceptionally well to gain a Silver medal in tough competition. The N.S.W. Surf Life Saving Championships is currently underway at the Swansea – Belmont Beach. The ‘MASTERS’ category of events were contested on Wednesday and Thursday in average ‘choppy’ surf conditions, albeit in a very competitive environment that included ex-Olympians. Mollymook surf club was represented by Tony Ireland, Paul Burton and Ed Mcartney. 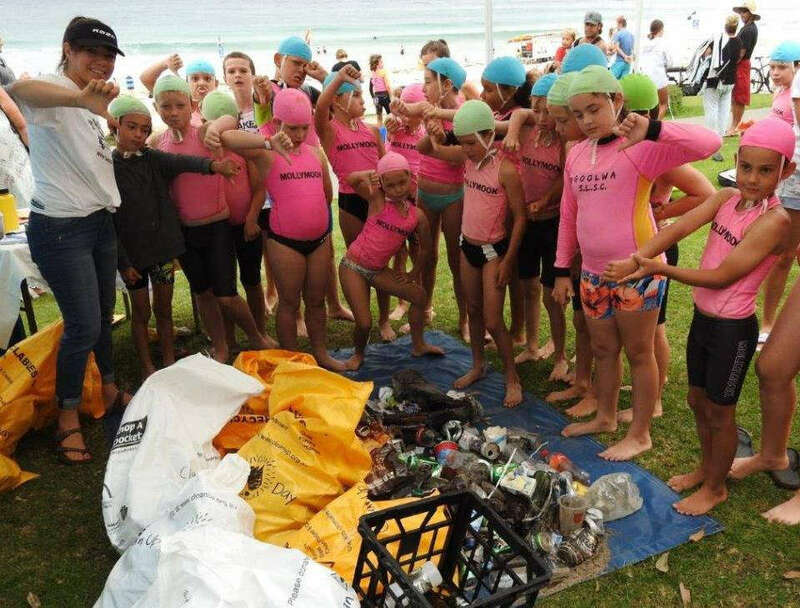 Moni thanked all the volunteers for their efforts on the Clean up Australia Day undertaken at Mollymook Beach on the weekend and a special thanks to all the Nippers, Mollymook Ocean Swimmers, Mollymook Surf Club members and local community members – Clean Up Australia Day!! What a fantastic start to our partnership with the TAKE 3 SLSC Project! Gauging from the reactions and enthusiasm from the kids and club members today, I feel this will be the first of many. Lovely to see our members protecting where we play. 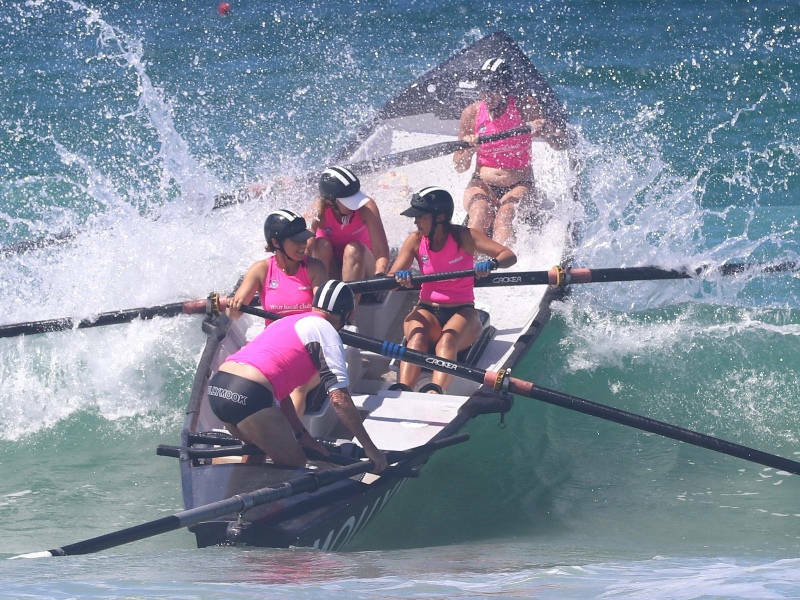 Some great stories emerged from the NSW Country Surf Titles but perhaps nothing more inspirational than the four Mollymook teenagers rowing at their first carnival who out rowed crews more senior than themselves to claim GOLD in the Under 19 female boat race. The teenagers consist of Eliza Green, Mia Garin, Kyla Wall and Chloe Scott. They row under the super competent coach and mentor Marty Drysdale.